Google Home Mini is a voice-controlled smart speaker, powered by Google Assistant. Whenever you say the word “OK Google” you get the help or information you ask for – with your schedule, reminders, calls, or learn the news, the traffic, and the weather forecast. 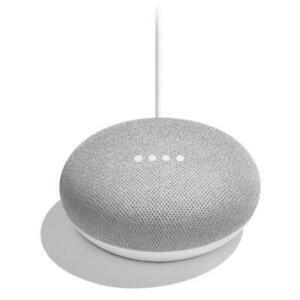 Furthermore, Google Home Mini comes with Chromecast and Chromecast Audio built-in, allowing you to stream shows and movies on your TV, or cast your favourite music to your home high-quality speakers. This compact chalk speaker features a built-in 802.11b/g/n/ac (2.4GHz/5Ghz) Wi-Fi and Bluetooth 4.1 support. Great smart speaker for the price. This speaker has some very good potential. It's easy to use and is packed with a good amount of features! Having these 'assistants' are becoming a normal thing in the home, just like the internet has become in our age. Its just a great addition to homes! Great on its own, even more things u can do with more than 1! I love my smart mini speaker smart assistant from google. It has excellent sound and I absolutely love it.